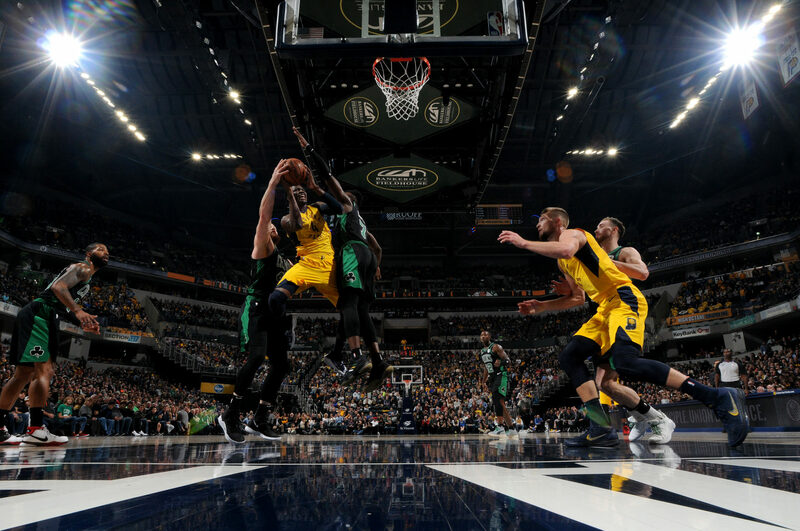 Victor Oladipo drained a clutch three pointer with three seconds left on the clock as the Indiana Pacers cooled off the red-hot Boston Celtics with a dramatic 102-101 victory on Saturday. The second year all-star Oladipo finished with 24 points and 12 rebounds for the Pacers who trailed by four points with 37 seconds to go before charging back. Tyreke Evans added 17 points as the Pacers shot 41 percent from the field. Marcus Morris had a team-high 23 points and six rebounds for the Celtics, who shot 43 percent overall in a tightly-contested game in front of a crowd of 17,500 at Bankers Life Fieldhouse arena. Indiana trailed 101-97 after Boston’s Kyrie Irving hit a three-pointer with 37 seconds remaining. Oladipo was fouled by Jaylen Brown with 29 seconds left and made both free throws to cut the Celtic lead to 101-99. With the clock winding down, Oladipo seized a defensive rebound and dribbled up the court before stopping on the right side and nailing a three pointer over top of Boston center Al Horford. On the next Boston possession, Gordon Hayward inbounded and had his pass deflected and stolen by Oladipo, who tossed the ball up to begin the victory celebration. Elsewhere, James Harden scored 25 points in his return to the Houston lineup, and the Rockets defeated the Chicago Bulls 96-88. The NBA’s reigning MVP Harden scored 11 straight points in a two minute span of the third quarter as the Rockets went on a 15-0 run. Harden had missed three games with a sore left hamstring, suffering the injury in a loss to Utah on October 24. Harden started slowly in his return to the lineup. He didn’t score until completing a driving layup with 3:55 left in the second quarter. Then he hit back-to-back shots from beyond the arc. Houston won their second game in as many nights after beginning the season a dismal 1-5. Veteran Carmelo Anthony had 17 points and James Ennis added 15 in the win. Houston seized control of the contest by outscoring the Bulls 21-7 in the third. Zach LaVine led Chicago with 21 points, and Wendell Carter had 14 points and 13 rebounds for the Bulls who lost their fourth consecutive game. Jabari Parker added 15 points as the Bulls also dropped their fifth straight to the Rockets. In Philadelphia, Joel Embiid continued to manhandle other teams around the NBA, scoring a game high 39 points and snagging 17 rebounds to lead the Philadelphia 76ers to a 109-99 win over the Detroit Pistons. Embiid scored 32 points in a dominating first half which also saw him make eight of nine shots and 15 of 17 free throws. Detroit got as close as five with 4:48 remaining before an Embiid layup and JJ Redick’s three-pointer which pushed the lead to a comfortable 10 points.